January 2015. As Britain shivers in freezing conditions, wave after wave of bad news highlights the growing crisis in the health service. A&E units are barely able to cope with the rising demand brought on by the Arctic weather. Nursing staff levels are severely stretched by stress-related absences. Some 999 calls are being downgraded to provide a more rapid response to fewer incidents. Reports say the NHS is hiring 3,000 doctors every year from overseas to cover staff shortages. Meanwhile, a private healthcare provider walks away from a flagship contract and England’s biggest hospitals veto the NHS budget over patient safety fears arising from yet more cuts in spending. This is the health service under the Conservatives, same as it ever was: underfunded, undervalued and under attack from right wing politicians and lobbyists who see an opportunity to promote privatisation as the solution to all the woes they have inflicted. The desperate straits in which the NHS now finds itself are a direct consequence of Conservative failure to maintain investment in the service. In addition to the relentless cutbacks, the NHS has been forced to accommodate the massive re-organisation first introduced by Andrew Lansley just weeks after his leader proclaimed there would be no ‘top down’ re-structuring of the service. 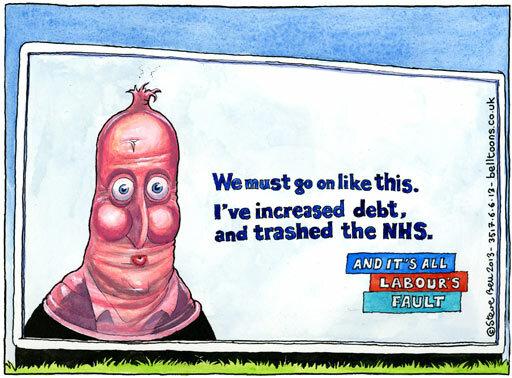 There is no doubt that David Cameron misled the public over his party’s intentions for the the NHS, just as his Chancellor has been misleading the public over the causes and solutions for the economic crisis that is still causing hardship and misery throughout Britain. The beating heart that sustains the myth of Labour menace is something like the following. Austerity is the necessary policy option because of the huge budget deficit left behind by the last government. It was the Labour Party that brought the country to its knees through reckless spending and welfare profligacy. Only because the coalition has stayed true to its course, amid the protests against welfare and other public spending cuts, has the economy finally begun to show signs of recovery. This is the Conservative hymn sheet and one that’s become as familiar as the ‘East Enders’ theme tune for the last five years; too bad it’s every bit as fictional and only a fraction as successful as the nation’s favourite soap. Britain has been deceived ever since George Osborne became Chancellor and the fact that he has been able to get away with his confidence trick only makes it feel worse. Where is the real heart and soul of the left when it is most needed? It doesn’t take a great deal of stat searching to disprove the myth that Labour broke the public finances due to wayward spending during its time in government. Official government data from the Office for National Statistics shows that Chancellor Gordon Brown kept net debt levels well within historical norms and even managed to run a budget surplus in the early days of New Labour. During the second term of Tony Blair’s government, having won a landslide majority on its mandate, Labour began to invest. Maybe this is where the ruination occurred? Between 2003 and 2007 the budget deficit (government borrowing) rose, but at around 3% of GDP a year this was manageable and well within historic norms. 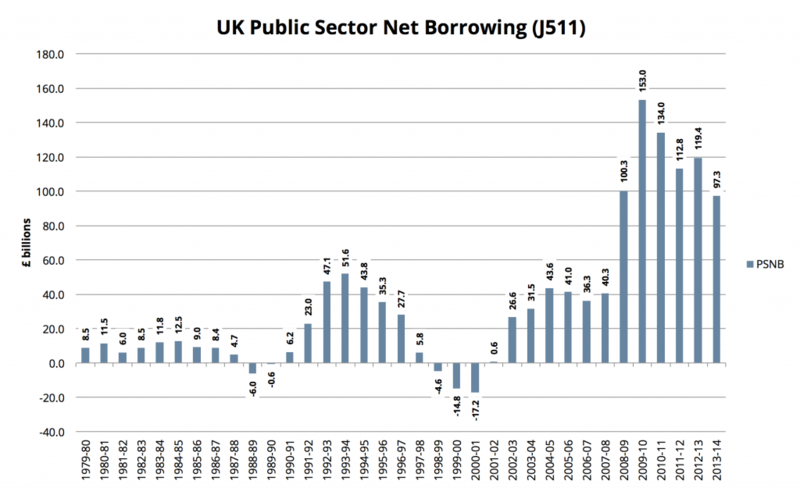 As can be seen from the chart above, the economy was also growing, neutralising the impact of the higher deficit, so that the total amount of net debt increased only modestly and remained below the levels when Labour came to power in 1997. What’s important to bear in mind in the argument about Labour’s recklessness is that this rising deficit was not due to increased welfare spending and handing out benefits to the idle and the undeserving. ONS data shows that welfare expenditure as a proportion of GDP was actually more or less constant at about 9.5% during this period. Even though government spending was on the increase, it was not being diverted to sustain a bloated welfare state. So what was Labour doing to max out the credit card? What basis is there for the Tory charge of playing fast and loose to bring the country to its knees? The simple answer is that spending under Labour between 2003 and 2007 was bringing Britain into the twenty first century after years of Tory neglect under Thatcher and Major governments. During this period of economic stability, the increase in net investment (e.g. new schools, hospitals, etc) from a miserly 0.6% of GDP in 1997/98 to 2% in 2007/08 was both justifiable and popular. As Duncan Weldon, BBC Newsnight’s economics correspondent has pointed out, governments that run surpluses over a long period of time come under increasing pressure to either spend or offer tax cuts; Labour chose to invest in the nation’s infrastructure. These increases in spending on health and education (respectively from 4.6% and 5% of GDP in 1997/98 to 5.5% and 7.2% in 2007/08) were much needed and totally aligned with public opinion. Let’s not forget that on this policy platform in the General Election of 2006, the Labour government comprehensively won a third successive term. In short, therefore, neither Gordon Brown, nor Alistair Darling, were reckless with the public’s money. Total managed public expenditure rose from 38.2% of GDP in 1997/98 to 40.9% in 2007/08, which is hardly the sign of rampant state spending heading over a cliff. Britain was nowhere near the brink of bankruptcy. And the notorious budget deficit was nothing like the root of all evil described by George Osborne. As can be seen from the chart below, it was comparable with that of the Conservatives under John Major even as Labour was doubling spending on the NHS. And this rise in the deficit followed three years of budget surpluses. Finally, the average maturity of UK government debt was 14 years, the longest in the developed world. That provided strong protection against crisis in the bond market as the debt was not about to require settlement in the short term. If Labour is guilty of anything, it is for assuming that the good times would always roll: for not doing enough to generate additional revenue to cover the increase in deficit created by investment in health and education. But since the Conservatives did nothing to provide a Norwegian-style sovereign wealth fund from North Sea oil revenues in the 1980s, they can hardly accuse Labour of failing to think ahead. And besides, politicians of any allegiance make very poor long term savers. The next election is always closer than any future crisis. But this is obviously very different from proclaiming his predecessors to be titans of ineptitude as Chancellor Osborne has done. And this is the intergalactic black hole in the Conservative narrative. Even if public spending hadn’t risen between 2003 and 2007, we would still have a huge budget deficit. Even if Labour had saved and maintained a surplus as it did during its first six years in power, we would still have seen a massive increase in public spending and felt the damaging effects of recession. That’s because in 2007, the wheels fell off the global economy triggering the worst economic slowdown since the 1930s. 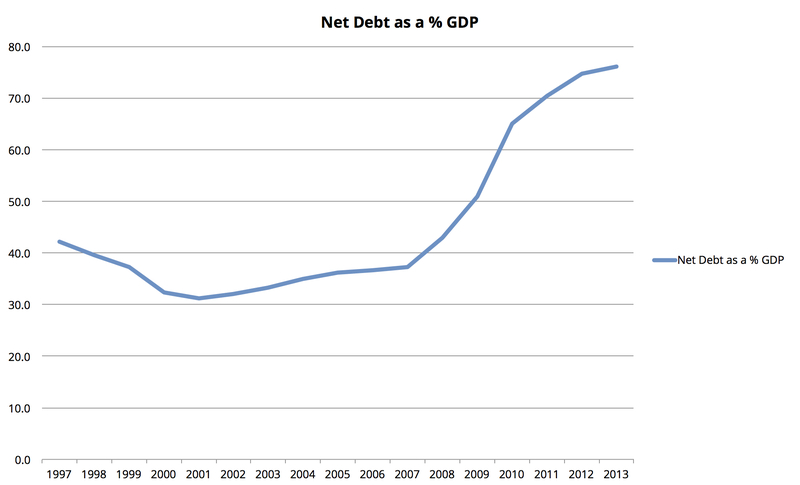 The dramatic climb in both the budget deficit and the total amount of net debt after 2009-2010 was mostly a consequence of the financial crisis. It’s a simple fact that when unemployment rises, tax revenue falls and social spending (income support, housing benefit) increases, with an inevitable negative impact on public finances. Labour just happened to be in power when the music stopped. If you think life would have been different had the Conservatives won the 2006 General Election, you’re living in an alternative reality. And actually, life would have been much worse. Six weeks before the Northern Rock crisis gave warning of the economic storm about to hit the UK, George Osborne and John Redwood made a major policy speech calling for increased de-regulation of the financial services sector and an end to “unnecessary” bureaucratic red tape. At the time, the pair claimed that there was no need to continue to regulate mortgage provision, saying it was the lender, not the client, who takes the risk. Imagine that. Even looser controls on mortgages and credit provision. Coupled with the notion that in the event of trouble, the bank will be responsible for its mistake and bear the cost of default. On the headstone of that piece of hare-brained economic idiocy must we carve the inscription “Too big to fail”! But you won’t find George Osborne admitting to any of this. That speech he made with Redwood has been quietly washed away like writing in the sand. The reality is that no matter who had been in government in Autumn 2007, they would have presided over a recession. And following the logic of Conservative policy at the time, (looser regulation, easier credit) their recession would have been more severe because they would have enabled the banks to dig even bigger holes for themselves. You can criticise Labour for wanting to maintain the welfare state, invest in the NHS and provide decent public services. But if you criticise it for its economic policy, you have to be clear that what you are really criticising are its efforts to repair the damage of twenty years of Tory mismanagement and for not predicting the global slowdown that no one, not Gordon Brown or George Osborne saw coming. For sure, Labour could have chosen not to invest in health and education but the recession would have happened all the same. The impacts would still have been felt severely but perhaps with just a little bit more room for manoeuvre. Would that be sufficient justification for us having an even more run down health and state education system today? Who knows. But what you would also have to admit is that the chief culprit of our fiscal woe is a recession triggered by blind faith in the power of free markets to be self-regulating and to act in the best interests of everybody. That is a fact that no amount of Tory spin can deny. The indulgence of an essentially right wing economic creed nearly destroyed the global economy. Conservatives broke the world, liberals took the blame. And it’s tragic that since 2010, the poor and disadvantaged have borne the brunt of fixing the mess through the most stringent cuts in public spending since the 1930s. Under David Cameron’s government, the poorest 5% of the British population have lost 3% of their disposable income whilst the better-off half of the country has seen an increase of between 1.2% and 2% (source: LSE/Institute for Social and Economic Research, University of Essex). Benefit cuts to the poor have funded tax cuts for the rich with no impact on the public finances because the budget deficit is higher than ever. Osborne has missed target after target as the public finances worsen and yet continues to blame his mistakes on his predecessors. More people are working, but salaries and terms and conditions of employment have failed to keep pace so they feel worse off and more vulnerable. A&E services are close to breaking point. We are living in a new dark age as councils are switching lights off to save money. Tax credits and other in-work benefits are at an all time high. Use of food banks has soared to unprecedented levels. It seems like the conservative plan for solving our economic problems are as ineffective and damaging as the conservative ideas that created the mess in the first place. An ONS analysis of the UK economy in the third quarter of 2014 showed that the modest growth was heavily dependent on consumer spending; individuals taking on more debt or running down their savings in order to make purchases. The rising debt levels once again suggest that the recovery, such as it is, is fragile and many people are in no position at all to weather further storms should economic uncertainty return in the future. And meanwhile, because employment growth has been concentrated in low-paid, self-employed and part time jobs, there has been a reduction in income tax revenues. As a consequence, Osborne’s economic record is an appalling shambles no amount of bluster and misinformation can hide. When he came to power in 2010, he confidently predicted government borrowing would be about £40 billion by the end of the parliament. Instead, Britain is now on course to borrow around £100 billion. The actual public sector debt itself has risen continuously under David Cameron’s government and in August 2014 had reached 77% of GDP, higher than at any time under the last Labour government. This is because Tory austerity crippled growth and stopped the recovery dead in its tracks, reducing revenues and increasing welfare payments for the unemployed and the working poor. But meanwhile, Osborne still found time for abolishing the 50p tax threshold and reducing corporation tax. “Suppose that for some reason you decided to start hitting yourself in the head, repeatedly, with a baseball bat. You’d feel pretty bad. Correspondingly, you’d probably feel a lot better if and when you finally stopped. What would that improvement in your condition tell you? But will Osborne put down his bat? Not in the slightest. The Autumn Statement makes it all to clear that even worse may be yet to come. Britain had the slowest recovery of all major economies from the financial crisis but surrounded by the the tatters of his shredded credibility, the Chancellor intends to go even further. Austerity 2.0 will be even better he proclaims, returning public spending to levels unseen since the 1930s. This is like an arsonist using petrol to try and put out the flames of a fire he started. Or like trying to persuade yourself that an infection can be cured once and for all if you would only cut off a finger. Then a finger becomes a hand, then a hand becomes an arm, and pretty soon, there’s nothing of the patient left to save. I just hope that in a few months, Labour can get its act together and put forward a cogent and persuasive analysis of how the recession happened and how the Tories have only made things worse since taking office. I don’t have high hopes that this will be the case, but I keep my fingers crossed nevertheless. Because another five years of Conservative government would ruin Britain beyond recognition. I feel like the soul and character of the nation is on the edge of an abyss and I just hope that it will step back from the brink.